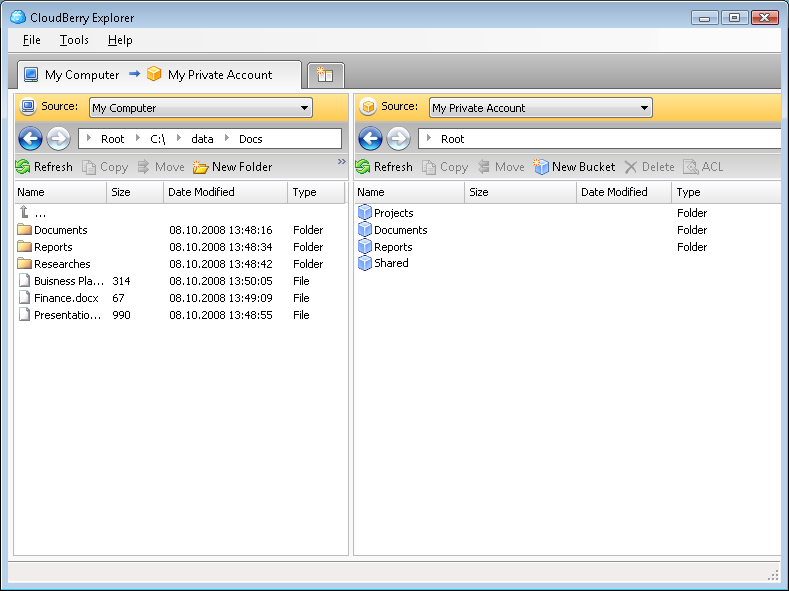 CloudBerry Explorer is a FREEWARE Windows Client for Amazon S3. CloudBerry Explorer makes managing files in Amazon S3 EASY. By providing a user interface to Amazon S3 CloudBerry lets you manage your files on S3 just as you would on local computer. ï‚§	With CloudBerry Explorer, Amazon S3 becomes an extension to your local storage. You are no longer limited to the classic data storage on your local drive(s). With CloudBerry Explorer, you can move files to Amazon S3 just as easily as managing them on your local drive(s). ï‚§	CloudBerry Explorer allows you to move large files such as photos, videos, and music to Amazon S3 and free up your local storage. ï‚§	The files on your Amazon S3 can be shared with anyone who has access to the internet. For security purposes, the S3 accounts can be password protected and access can be restricted. S3 Browser - S3 Browser is a unpaid user interface for Amazon Secure Storage Service. Amazon S3 offers a simplistic WWW services interface that can be exploited to put in and recover any quantity of information, at any time, from anyplace on the World Wide Web. S3 BackupSystem - S3 BackupSystem is freeware application that allows you to easily backup your files and folders onto secure storage servers of Amazon, created specifically for industry-grade file storage. Tarantula - A fast and simple search tool for Amazon.com. This program speeds up the process of searching through Amazon's store by providing you with fast access to the browse node within each Amazon store. Amazon PCN IE Toolbar - Amazon Price Change Notification Toolbar indicates availability of APCN, and will engage Price Watch in one click. Amazon Price Change Notification Service watches pices at Amazon Webstore and notifies user if price changes. WizzDrive - Easy to use online file backup and sharing application, enabling you to set and forget your content backup and be able to securely share with people and access and view from any browser in the world without requiring access to your PC. Wootch - Wootch allows to monitor the prices of desired articles at Amazon. The user is automatically notified when the price falls below the requested price. Wootch is free, multilingual and combinable with Amazon .de/.fr/.com/.co.uk/.ca.